Books Used Throughout Lessons 1-10 - Fun With Science! ***Please note: Found some links to author's websites,teacher lesson ideas, or reviews. Just click on books on this page for links to other resources. A River Runs Wild by Lynne Cherry: Harcourt Children's Books:1992, 40pp. ages 6-12..This book tells the story of how The Nashua River in New England became polluted during the Industrial Revolution as did so many of our Nation's rivers. It continues to tell the story of how a few courageous citizens worked hard to be heard in order to save the river. Wolf Island by Celia Godkin,Scientific American Books for Young Readers, WH Feeman and CO.,1993.40pp Grade1+- Based on an actual event this book tells the story of what happens to a community of animals when a group of animals disappears for a time. It demonstrates the impact that a delicately balanced ecosystem feels when a family of wolves leaves for a bit. When the family returns to the island balance is returned to the island. This story addresses what happens in all food chains when the highest link is removed. 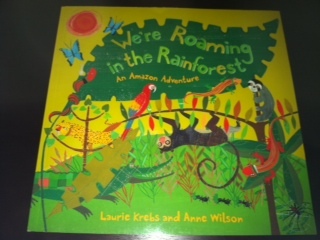 We're Roaming the Rainforest- An Amazon Adventure by Laurie Krebs and Anne Wilson.2010, Barefoot Books.,pp.37. An amazing book about the Rainforest. Three adventurers set off on a journey that takes them through the rainforest where they come across some exotic creatures in their natural habitat. Beautifully illustrated with rich colors. I especially like the reference section that includes a map detailing the area. The author also gives more detailed descriptions of the animals found in the story. ISBN-978-1-84686-545-9--Click on Book Title to learn more about Laurie's books on her website. Who Eats What? 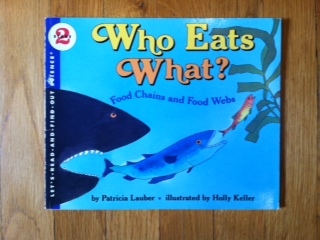 Food Chains and Food Webs by Patricia Lauber, Illus. Holly Keller, 1995 Harper Coolins, pp 32. Grades k-2. Simple descriptions of key terms related to food webs and food chains. Relates nature's food webs/chains to ours. Allows students to make great connections to the content being studied. Drawings are vivid and kid friendly. Great for diverse learners, readers below reading level, and ESL. Great jumping-off point for more detailed discussions. 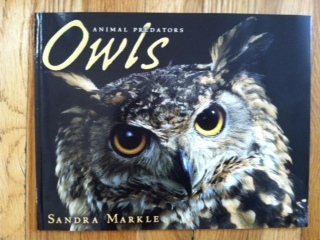 Owls by Sandra Markle, 2004, ,Carolroda Books. pp38, Grades 3-5, Incredible photographs of this mighty Predator. Great way for kids to feel like they are there. The details are amazing and are useful for the study of adaptations, predators vs. prey, as well as how animals "fit into the food chain". Great companion to the Owl Pellet activity. 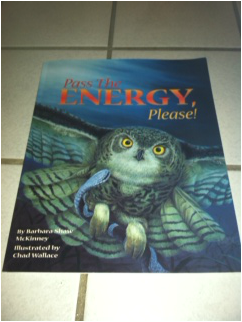 Pass the Energy Please by Barbara Shaw McKinney, illus. Chad Wallace ,Dawn Publications, 1999, 32pp. Poetry for all ages- I love, love, love this book! 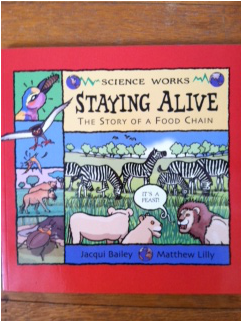 Terrific text on how energy is passed along the food chain. The descriptive rhyming engages the reader. The author connects producers, consumers, and decomposers in a variety of Terrestrial and Aquatic Food Chains most creatively allowing students to make real connections to text. The poetry aspect should make for better recall later when students need it. A great way to present content and can serve as a starting point to in the unit or a wrap up. It also highlights our key role to protecting our resources. 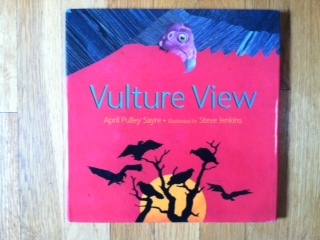 Vulture View by April Pulley Sayre, illus.Steve Jenkins, 2007, Henry Holt and Company. 28,pp, Early Elementary. Great basic book to introduce during a lesson. The illustrations help connect content when comparing the adaptations of the Turkey Vulture and those of an Owl. By studying their differences students can begin to make inferences about the importance of adaptations as well as the necessity of all creatures in our food chain and ecosystems. The book shares the lesson that every creature has a role and each creature adapts to be the most efficient in their role. Kind of fun to learn more about those big majestic birds everyone sees while driving interstates, country roads, and highways as the big bird dodges traffic. 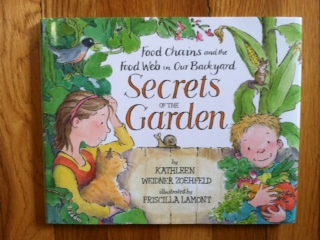 Secrets of the Garden by Kathleen Zoehfeld,illus.Priscilla Lamont.2012, by Random House, 31pp.-ages 4-9. This book introduces the concepts of food chains, food webs, herbivore, carnivore, omnivore, and decomposers by following the story of a family preparing their summer garden for planting. It begins during spring and progresses through the canning months. With the help of some engaging chickens the children in the story learn about food chains and food webs as they watch their garden grow. Students connect with the illustrations and content as the details of how food webs and food chains work are illustrated. Think it is a great book to use as an overview to the content. 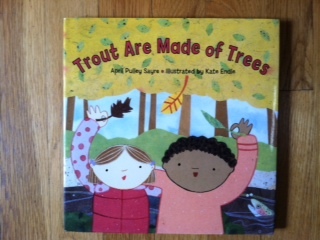 Trout Are Made of Trees by April Pulley Sayre, illus. by Kate Endle., 2008,Charlesbridge Publishing. 29pp. Awesome way for students to see how important plants are in the food chain. Allows students to practice making inferences by connecting a dead leaf floating down the stream to the food we eat. What transpires in between the journey is a detailed look at the lives of the smallest creatures in a stream. A great companion to any "Pond Water" activity. Actually helps students make the connection to conservation by providing many resources--truley one of the best on the list!